Front opening doors offer quick access to a dolls house roombox or miniature collection but can also decorate a regular piece of furniture. They are very useful for a child's dolls house as they help keep contents in one place, and when closed, give everything a neat appearance, regardless of the state of the contents. For children, front opening doors are an echo of the real world and at particular stages of their development, they like the intrigue of a dolls house where things are hidden behind an opening. The same type of doors can be used on the back of a regular dolls house to keep the contents dust free. Baltic Birch Plywood The townhouse doors shown used the remainder of the wood laid out in the Baby House Case Plan. If you are fitting doors to a different design, you will need enough 3/8 or 1/2 inch Baltic Birch Plywood to fit across the front of your house, plus a cutting allowance. You could also use MDF or good both sides plywood. Table Saw to cut the pieces to size. If you don't have a table saw you may be able to arrange for a lumberyard to cut the pieces for you. Birch Edging Tape to finish the edges of the plywood doors and the exposed plywood edges on the door and window surround, iron on wood edging tape was used. Iron to apply edging tape. Sharp box cutting knife to trim iron-on edge banding after it is applied. Carpenters Glue to glue case together. Dollhouse Doors and Windows We used a door from Dijon and standard Georgian Windows, available from many dolls house suppliers. The windows were chosen to suit a plain house front, as well as to allow a child clear views into the spaces inside. Power Jigsaw to cut window and door openings. Sharp Chisel to cut recesses for the door hinges. Sanding Block or power sander. Sandpaper Use a finishing grade paper (180 or higher) Baltic birch plywood will need a little sanding. Fine Steel Wool to prepare the wood for a finish and to sand the finish between coats. Wood Finish of your choice. We will use a clear polyurethane varnish to show off the wood. The doors on a front opening dollhouse are determined by the size of the house or case.These doors were designed to finish off the front of the Baby House Roombox shown here. The 1/2 inch Baltic birch plywood left over from constructing the baby house frame is sufficient to make these doors. This baby house is based on a collection of two sizes of roomboxes, three full-sized rooms, and three small rooms. The collection is designed to have a townhouse style. To showcase the collection each roombox will have a window or door opening into it from the front of the house. This will help shape the front of the house. As this case has a set of narrow rooms on one side, and wider rooms on the other, the size of the doors will be determined by the rooms behind them. Each door will completely cover one set of roomboxes. As the case is designed to be used by a child, the doors and windows chosen are large, to allow good views into the house interior. To break up the plain front of the roombox, four window sizes have been chosen. The wide side will have three Georgian style windows in standard sizes, fifteen, twelve and nine panes. The curved window over the door will be echoed by an arched window which matches the twelve pane window in size. As the doors and windows must line up with the roombox interiors, the guidelines for the shelves which support the roomboxes are measured out on the plywood which will make the case front. An allowance for the top and bottom of each roombox is marked as well, to make sure the doors and windows are installed where they do not cross the roombox floors or ceilings. The doors will eventually have quoin molding covering the door join, and the hinges at the side of the case, so the molding is laid in place on the plywood and the door and window positions are measured and marked. When you have determined where your doors will divide, cut your plywood into to main door pieces. For the Baby House from the case plans, which is 21 inches wide by 29 1/2 inches long, two doors were cut with measurements 8 1/4inches side by 29 1/2 inches long, and 12 5/8 inches wide by 29 ½ inches long. These doors leave a 1/8 inch space as a gap at the front in case the finish veneer is thicker than expected. The front opening between the doors will eventually be covered with a piece of quoin molding trim as shown in original measuring layout. Having carefully measured your door and window positions and made sure you have marked the openings square with the sides and base of the doors, cut out the openings for your doors and windows. Small errors will be covered by the door and window trim. The doors and windows I used were designed for 3/8 inch wood. To adjust for the wider wood depth, the openings will either need to be filled once the acrylic panes are in position, or the edges of the plywood will need to be finished with a veneer. To cover the edges of the plywood with iron-on veneer in the doors and window openings, the openings must be cut large enough to take both the veneer and the window or door. With the holes cut in the doors for the scale windows and doors, it is time to check the fit. Test fit all the windows and doors into their openings. Use a sanding block to enlarge the openings if necessary. Make sure that the windows and doors fit square and true. If your openings are a bit too large, you can shim the door or window in place with pieces of matchwood cut on an angle. Any wood that protrudes after the fitting is shimmed in place can be cut off flush with the inside of the door before the interior trim is added. In the photo above you can see that the windows will not completely fit through to the interior face of the dolls house door. As there was enough wood in a single sheet of plywood to cut doors as well as the case, 1/2 inch plywood was used for the doors. The window openings will be finished with veneer and the interior moldings set to line up with this finished edge. Alternatively, a narrow piece of wood stock can be fitted to the interior to extend the window ledge into the room and cover the unfinished edge of the plywood. Iron On the Veneer Trim Veneer trim tape is used to finish all cut edges of the doors. In our case, We are also using it to finish the door and window openings to compensate for the fact that the doors and windows will not pass completely through the plywood. After ironing on the trim, carefully cut it to fit, and sand the edges gently when the glue has cooled. Make sure the outer edges of the doors are neatly covered with no protruding ends of veneer. In the photo of the window shown above, you can just see the veneer tape that now lines the window opening, covering over the rough edges of the plywood. The window glazing can now be fitted into the window and the interior molding matched to the edge of the window surround. If your molding cannot be adjusted to fit, you can use narrow stripwood to fill the gap in the window sill and match up with the molding. In that case, you would not need to fit the window and door openings with veneer to cover the plywood edges. Front opening dolls house doors fitted with windows and a 1:12 scale door, ready to install on a baby house cabinet. Photo copyright Lesley Shepherd, Licensed to About.com Inc. When all the edges are veneered, fit the dolls house doors and windows into their openings, check that the interior moldings will fit and finish the interior edges of the doors and windows and carefully glue the window frames into place. The glazing and interior molding can be put in place easily once the doors are hung. If you prefer, you can fit all the windows in place after the doors are hung on their hinges. To give the dolls house doors a neater outer appearance, the cranked or overlayed hinges are recessed into the back edge of the door. If you look closely at the photo of the hinge above, you can see where a chisel was used to cut out enough wood to allow the round barrel of the hinge to fit partially into the back of the door. This will give the hinge a neater appearance on the outside. The photo also shows how the cranked hinges are mounted so that the screws are not in the end grain of the wood. The hinges shown are not yet fully screwed in place. In the photo above you can see how recessing the hinge into the back edge of the door gives it a low profile on the outside of the dollhouse. 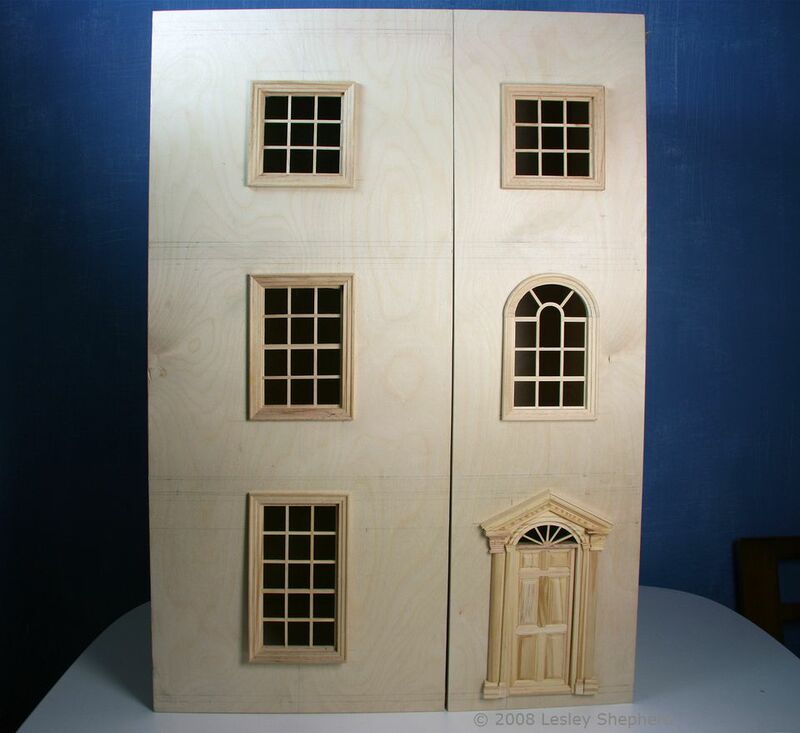 The doors can be left this way, with the hinges and front opening showing, or trim can be used to make a slightly more elaborate front facade for the dolls house or baby house. Once you know that the hinges are correctly positioned, finish inserting all the screws into the hinge plates. If you wish to add trim, glue it in place covering the opening front edges of the dolls house doors, and extending slightly over the front side edges of the dollhouse to cover the view of the hinges from the front. When you have applied your chosen trim, use an eraser to remove all your reference markings and do a final finish sanding of the dolls house case and doors, using fine steel wool, not sandpaper. Do not sand too hard or you could go through the veneer. Apply a base coat of finish to the wood. If you will be painting the wood, use a latex primer base coat and a good quality brush. When the primer coat/base coat is dry, use fine steel wool to rub out any brush marks and apply a second or final coat. Use a tack cloth to remove any dust before applying the second coat.